Many film writers refer to screenings at Jonas Mekas' Film-Makers' Cinematheque without identifying the actual venue. This can be confusing because the Cinematheque often changed location and sometimes the venues used were advertised under different names. The 41st St. Theater became the 42nd St. Cinema which became the New Cinema Playhouse. The New Bowery was the same venue as the American Theatre for Poets (when it was subleased by Diane di Prima) as well as later being called The Bridge. Mekas used the term "Cinematheque" almost like a type of branding to advertise screenings at different venues over time. 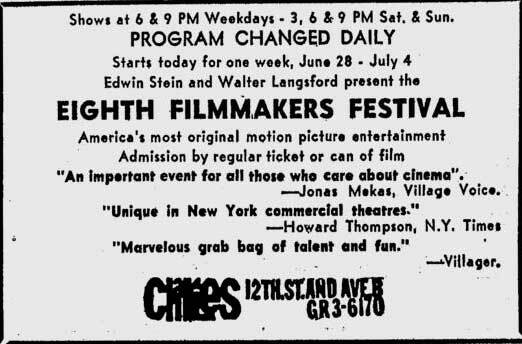 Sometimes writers incorrectly refer to Mekas' pre-1964 screenings at venues like the Charles Theatre as Cinematheque screenings when the Cinematheque was not started until late 1964, as announced in the pages of the Village Voice. Many of Mekas' screenings (both pre and post Cinematheque) were advertised in the Voice for which Mekas also wrote a column titled "Movie Journal" beginning with the 12 November 1958 issue. At the time he started writing for the Voice, he was already the publisher and editor of Film Culture magazine which began publication in 1955. In 1960 he helped to form the New American Cinema Group (or simply "The Group") which promoted American experimental film as the "New American Cinema." A year or so after The Group was formed, Mekas established the Film-Makers' Co-op which, according to film writer David E. James, "came into being on 18 January 1962." As the main film columnist for The Village Voice Mekas was able to review the films he screened without necessarily mentioning that he was behind the screenings. As time progressed, however, it became clear that he was often behind the screenings he was reviewing, particularly when he ended up in jail for showing Jack Smith's Flaming Creatures. In Lithuania Mekas' main interests had been poetry and literature rather than film. He was forced to leave the country because of his involvement in "anti-German activities" at a time when Lithuania was occupied by Germany. Trailer for The Search (1948) starring a "handsome new American star Montgomery Clift." Mekas and his brother arrived in the U.S. as refugees on 29 October 1949. In addition to shooting his own footage, he attended screenings in New York. In the early fifties he met Louis Brigante which apparently led to him holding the first screenings of his own. Although many film writers have written about the screenings Mekas held at the Charles Theatre in 1961 as his first screenings, Mekas has stated that he actually started showing films in 1953. In January 1955 the first issue of Film Culture came out with Mekas and his brother on the editorial board which also included George Fenin, Louis Brigante and Edouard de Laurot. Despite apparently having presented their work at the Gallery East in 1953, Mekas "lambasted" the films of Gregory Markopoulos and Kenneth Anger in an early issue of Film Culture. The Summer 1961 issue of Film Culture included "The First Statement of The New American Cinema Group" which included Mekas on the executive board (as well as Warhol's friend, Emile de Antonio.) The statement was headlined "THE GROUP." The temporary executive board that was elected at the meeting consisted of Shirley Clarke, Emile de Antonio, Edward Bland, Jonas Mekas, and Lewis Allen. (PA79) The "FIRST STATEMENT" of the The Group included a scathing appraisal of mainstream cinema at the time which, they noted, was "running out a breath:"
"In the course of the past three years we have been witnessing the spontaneous growth of a new generation of film-makers - the Free Cinema in England, the Nouvelle Vague in France, the young movements in Poland, Italy, and Russia, and, in this country, the work of Lionel Rogosin, John Cassavetes, Alfred Leslie, Robert Frank, Edward Bland, Bert Stern, and the Sanders brothers. The official cinema all over the world is running out of breath. It is morally corrupt, aesthetically obsolete, thematically superficial, temperamentally boring. Even the seemingly worthwhile films, those that lay claim to high moral and aesthetic standards and have been accepted as such by critics and the public alike, reveal the decay of the Product Film. The very slickness of their execution has become a perversion covering the falsity of their themes, their lack of sensitivity, they lack of style. They also outlined 9 principles of The Group, which included a rejection of the "interferences of producers, distributors and investors until our work is ready to be projected on the screen;" a rejection of censorship, a "reorganization of film investing methods;" low budgets; a rejection of the "present distribution-exhibition policies;" the establishment of "our own cooperative distribution center;" an East Coast film festival to serve "as a meeting place for the New Cinema from all over the world;" lower union rates for low budget films; and the building up of a fund from a percentage of film profits to "help our members finish films or stand as a guarantor for the laboratories." Two of these principles are of particular interest - the establishment of a cooperative distribution center and an East Cost film festival of New Cinema. Initially Emile de Antonio was put in charge of "cooperative" distribution, with several cinemas pledging to show the films of The Group - The New Yorker Theater, the Bleecker Street Cinema, and the Art Overborook Theater. De Antonio left The Group within the year however and Mekas founded the Film-Makers' Co-op. According to David E. James, the Co-op "came into being on 18 January 1962." Mekas doesn't specify that the "Open House" screenings were midnight screenings. 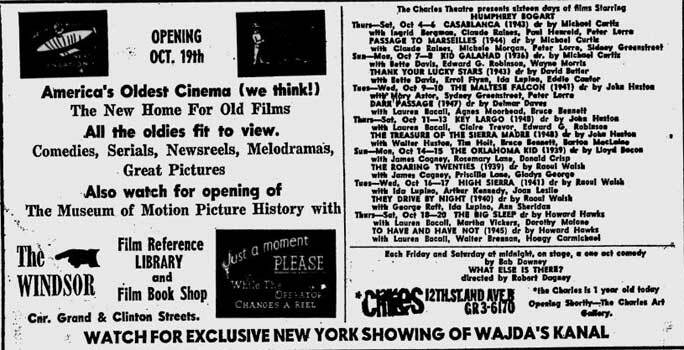 The Village Voice ads for the Charles show that filmmakers were invited to bring their work to screenings or festivals that weren't at midnight and that midnight screenings were often devoted to one filmmaker. The weekend midnight screenings were not publicised as Co-op events and Mekas did not mention them in his Village Voice as Co-op events. In fact, he didn't mention that he had anything to do with them. Because of this, it's difficult to know exactly what his input was or when exactly it started. 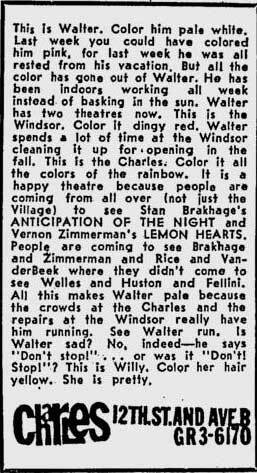 In his 5 October 1961 column for instance, he announces "The Charles Theatre, 12th Street and Avenue B, is open again, with a series of selected revivals. The new owners - Walter Langsford and Edwin Stein, Jr., want it also to be known that the theatre is open for any adventurous 16-mm screenings, experimental films, etc. if anybody has anything. So let's do something about it. "(JMV13) Although film writers would later characterise Mekas' screenings at the Charles as a sort of "bring your own film" events, here we have Mekas presenting the idea as the idea of the new owners rather than himself. 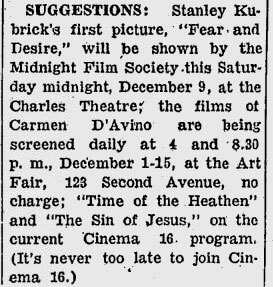 The first midnight screenings at the Charles were advertised in November 1961, not long after Mekas' column informing his readers that the owners of the venue were looking for experimental films. Most of the midnight screenings focused on the work of a single director. The first ad mentioning a midnight screening was in the 2 November 1961 issue of the Voice for a midnight screening of films by Lewis Jacobs, with Jacobs present. Sometimes the ads would only promise a "sneak preview" for a midnight screening such as the ad in the 16 November issue. On the 23rd of November, an ad appeared announcing "midnight experimental previews" which were a "FREE addition to Regular Show." 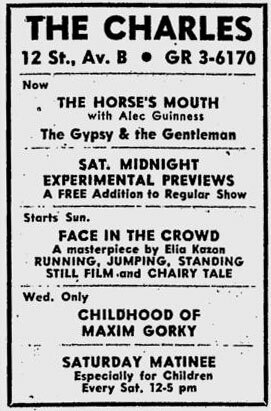 Again, it's difficult to know whether Mekas actually had anything to do with these midnight screenings or whether they were due to the efforts of the cinema owners, Langsford and Stein, Jr. The following week's issue contained a large ad for a Marie Menken "retrospective." It's likely that Mekas had something to do with that evening as he championed Menken's films and it was a midnight screening, although not an "open house" screening. 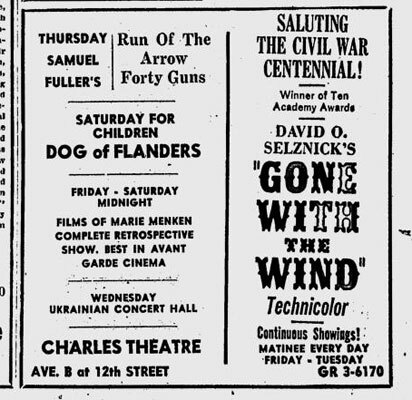 He followed it up in his 4 January 1962 column with a glowing review of the screening and complaints about the fact that none of the mainstream film critics had attended the screening, apart from Archer Winsten, the reviewer for the New York Post. In his column Mekas does not claim to have had anything to do with the retrospective. Marie Menken was one of the filmmakers whose work Mekas praised in his column. Others included Stan Brakhage and Robert Breer. In his 15 March 1962 column, for instance, he praised the work of Brakhage, Menken and Breer over Alain Renais' Last Year at Marienbad. At the time, Mekas thought that Marienbad's "forced intellectualism" was "sick." I can see the historical importance of Marienbad as a forerunner of a commercial experimental film... Renais breaks away from the realist tradition, goes into the subconscious. And that is his greatest contribution to the contemporary dramatic film. The next step is the experimental poetic cinema. As it is now, I still prefer the pure experimental poets like Kenneth Anger, Stan Brakhage, Marie Menken, Robert Breer to the commercial-experimental cinema of Renais. Their work makes me see the world and myself in a new way, and the beauty of it sends me into ecstasy. This is modern cinema and it is a cinema that is human in the most essential way. Marienbad, in comparison, is a frozen, pretentious ornament, full of postures, declamations. Its forced intellectualism is sick." 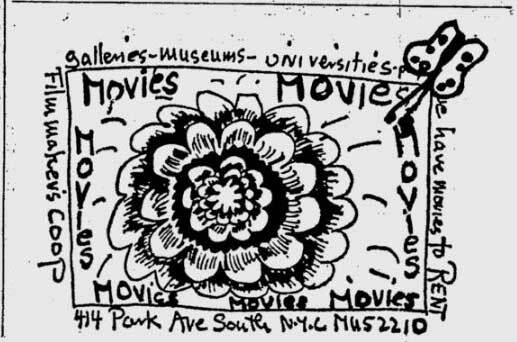 Two weeks later, in the February 22nd issue, the Charles ad gave a general overview of the cinema, promising "a Baroque Chamber Music ensemble," jazz musicians and "a complete program of the most exciting new films of America's finest experimental filmmakers" - not to mention "free coffee." Midnight films of Stanley Vanderbeek were scheduled. Other midnight screenings during the first three months of 1962 included Rene Clair's I Married a Witch (5-6 January); the films of Nicholas Webster (19-20 January); films of Rudy Burckhardt (26-27 January); films of Joseph Marzano described as "most promising new film-maker" (2-3 February 1962); two "rare silent classics" - The Slums of Berlin (1925) and Le Brasier Ardent (1923) on 16-17 Feb; films of H.G. Weinberg advertised as "a noted critic's fascinating experiment films - among the earliest in the U.S. along with an unidentified film by Sergei Eisentstein (16-17 March); films by San Franciscan Larry Jordan with The Bridge by Vido and Fortune's Fool by Emil Jennings (23-24 March); a retrospective of films by Francis Lee (30-31 March). In April a Shirley Clarke retrospective was was announced. Clarke, as noted earlier, was a a founding member of The Group and would also later be involved in the Film-Makers' Distribution Center with Mekas. 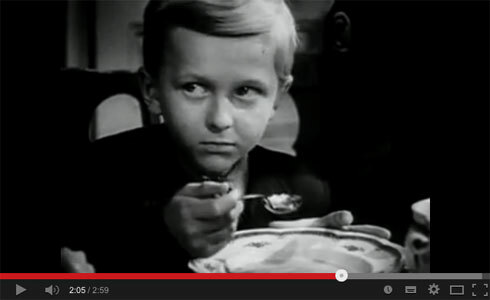 Although Mekas would, later in the year, identify some of the independent filmmakers who were "waging the real revolution of new cinematic forms and content," as Ron Rice, Stan Brakhage, Marie Menken, Breer and Leacock (JM69), most of the midnight screenings during 1962 had nothing to do with these filmmakers. Screenings for the first half of the year included James Broughton (13-14 April); three films by Alain Renais (25-26 May); Norman McLaren, Slavko Vorkapich and Weegee (8-9 June); and a James Davis retrospective (15-16 June). But who programmed these midnight screenings? Mekas or the owners of the cinema, Langsford and Stein? Mekas continued to write about the screenings as though he had nothing to do with them. Nor did he claim responsibility for the bring-your-own-film Filmmaker's Festivals held at the Charles which, in any case, did not take place at midnight. 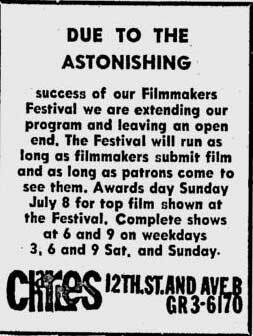 The bring-your-own-film festivals were apparently so successful that they extended the program, leaving it open ended. According to the announcement in the Voice the Festival would run "as long as filmmakers submit film." Although this sounds like Mekas' open screenings, neither he nor the Co-op were mentioned in the ad and the screenings did not occur at midnight. The following week's issue included the announcement of the "World Premiere" of The Flower Thief starring Taylor Mead who was a particular favourite of Mekas (and later of Warhol's). 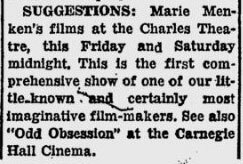 Mekas reviewed the screening in the following week's issue (July 19th), again not suggesting that he had anything to do with it although he did mention that he had seen a few versions of the film - despite the fact that the Charles' screening was billed as the "world premiere." 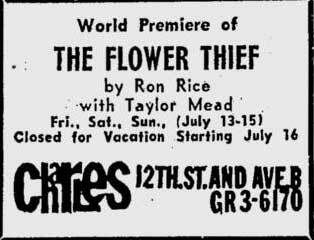 "Taylor Mead of The Flower Thief (directed by Ron Rice; at the Charles Theatre) is the happy innocent, the unspoiled idiot. He has a beautiful flower soul. He will go to heaven like all children do... The idiot (and the beat) is above (or under) our daily business, money, morality. It is bad, it is pretty bad when we have to learn from the idiot, but that is exactly where we are today. All wise men have gone mad. 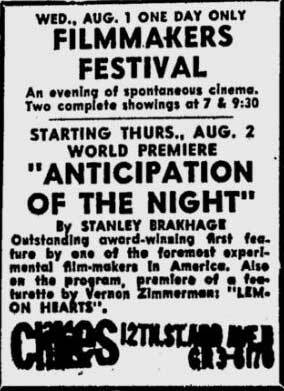 The August Filmmakers Festival took place at 7 and 9:30 pm on August 1st, with another "world premiere" taking place on August 2nd - Stan Brakhage's Anticipation of the Night. Scott McDonald: I understand that there was a break between you and Amos Vogel because he would not show Anticipation of the Night (1958) at Cinema 16. Is that true? What was your experience with Cinema 16? Stan Brakhage: Well, that's true about Amos and Anticipation... His view was that the film would destroy my reputation. I didn't see that I was having any kind of reputation anyway... But the break with Amos wasn't about his refusal to show or distribute Anticipation. There were other films that Amos refused to show or distribute, like Marie Menken's new work; and I told Amos, 'Until you distribute Marie Menken's new work and Anticipation of the Night, I won't give you any of my new work.' There were other films he wanted. So that was the break that finally led to Jane and I advertising that we would distribute films, and that we had an agreement with Bruce Conner and other people we knew about, to distribute from our home in the mountains in Colorado. At that point, I arrived in New York to begin showing some of my work that Amos was distributing and some work by other people, and at that precise moment, Jonas and Adolfas were deciding to create Film-makers' Cooperative. So we more or less came to an agreement to pool our resources and that's how the New York Co-op began. Jonas and Adolfas were in a better position to do distribution than Jane and I were: they were in New York and they had backing of some kind or other - enough support for the moment, and eventually they also came to have the support of Jerome Hill. Or perhaps Jerome was already involved. So I just became part of their efforts. The Charles ad in the following week's issue of the Voice announced the opening of another venue. It mentions Anticipation of the Night but doesn't mention Mekas. In September, Andrew Sarris substituted for Mekas as the author of the "Movie Journal" column in the Voice. He wrote a scathing criticism of the Filmmakers' Festival at the Charles Theatre and the New American Cinema which had been championed by Mekas. The column was subtitled "Hello and Goodbye to the New American Cinema." The New American Cinema is nothing but an idle pastime for intellectual ragpickers. Its art is so marginal that any critical evaluation degenerates into trivialities. My! That was a god shot! Look at the camera moving without wobbling! The montage is beginning to get to me! Unfortunately, most of the tentative efforts at the Charles are less the first step than the last stop, and this is particularly true of the polished relics of the avant-garde." 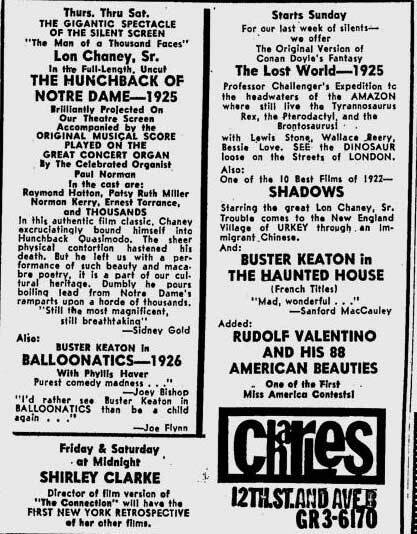 In the Charles ad for in the 4 October 1962 issue, the midnight film screenings were replaced by a live stage production. The ad also announced the opening of their sister cinema, The Windsor on 19 October. 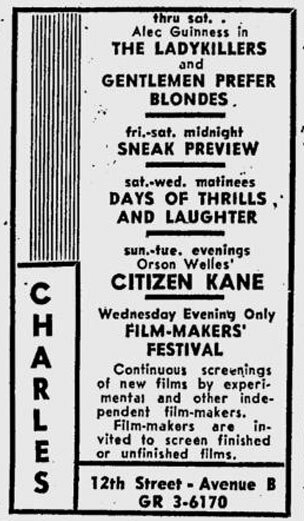 Yet by November the Charles Theatre was in serious trouble and on verge of closing - despite the previous claims of the popularity of their experimental film evenings or festivals. No ads for the Charles appeared in the November and December issues of the Village Voice although they were listed in the "At The Movies" section in November. In the November 15th issue they were listed as showing Frantic, Leda, House of Dracula and The Undead. In the November 22nd issue they were listed as showing Fear and Desire and The Killing. In the November 29th issue, however, there was simply a note: "Schedule unavailable at press time." (p. 13) There was no listings at all during December but in the January 10, 1963 issue, there was an ad for the Charles - now called The New Charles with the note that it was "under new management" and was "opening next wed. January 16th." Despite the claimed popularity of the experimental film screenings or filmmakers' festivals, the New Charles promised a more mainstream program: "the Finest in Current Film Entertainment." Later in January, Mekas announced in his column that the magazine Film Culture would be presenting midnight screenings at the Bleecker Street Cinema, without mentioning that he was the editor and publisher of the magazine.